Arthur Upfield was born in Gosport, Hampshire, England on 1 September 1890. His father, a draper, sent him to Australia in 1911. On 23 August 1914, he joined the First Australian Imperial Force as a Driver with the 1st Light Horse Brigade Train (5 Company ASC [Army Service Corps]). Surviving Gallipoli and trench warfare in France, in 1915 Upfield married an Australian nurse, Anne Douglass, in Egypt. He was discharged in England in 1919, working as a private secretary to an army officer for two years before returning to Australia with his wife and son in 1921. Upfield spent about twelve years working at a variety of jobs in the outback where he became fascinated by Aboriginal culture. From his observations of their intrepid survival skills in this harsh environment, he created the character of Detective Inspector Napoleon Bonaparte, who was based on Leon Wood, a half-caste Aboriginal employed as a tracker by the Queensland Police. The trial of Snowy Rowles, convicted of the Murchison Murders, made Upfield a celebrity. Rowles had plotted three murders in the manner of Upfield's criminal in his novel, The Sands of Windee, publishedin 1931. (Rowles was hanged for the murder of Carron in 1932). Upfield's crime novels were taken up by the Crime Club in the US with great success, enabling him to write and travel the country with ease. He led various expeditions for the Australian Geological Society and following some years living at Bermagui, (NSW), he moved to Jasmine Street, Bowral (NSW) with Jessica Hawke. Her 'biography' of Upfield, Follow My Dust (1957) made use of Upfield's extensive, unpublished memoirs. Upfield died in Bowral on 13 February, 1964. The Lake Frome Monster, published in 1966, was completed by J.L.Price and Dorothy Stange. Click here to read Travis Lindsey's thesis on Arthur Upfield for Murdoch Iniversity in 2005. Click here to see details and a film clip of IN SEARCH OF BONY, the SBS documenary from 2006, regarding Upfield's publications both here and abroad. Click here to view a story from the National Library of Australia on Upfield and the Rabbit Proof Fence. 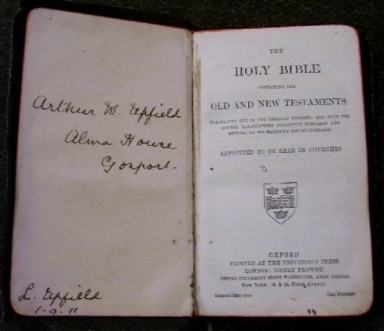 Arthur Upfield's bible, a birthday gift from his father in 1911 (William Upfield Collection). 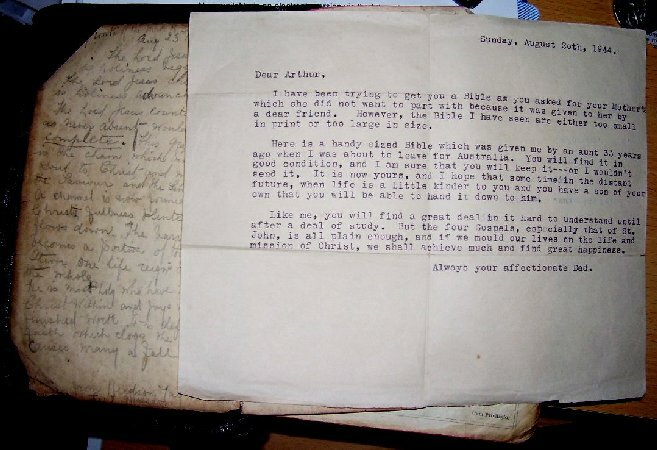 Upfield was given a second bible that same year, which he annotated extensively before passing it on to his son, Arthur James Upfield, in 1944 . View.